We've offered fresh kaffir lime leaves in small packs since 1999, and shipped to tens of thousands of homes & restaurants across America. We continue to sell more every year. What makes our fresh lime leaves so good starts in the field. The trees are all grown on the same small, sunny farm in the United States, with great irrigation and soil. The soil is fertilized (our leaves are not certified organic). The leaves are never sprayed. Due to careful attention to detail, our leaves are consistently very clean, as shown here. Every harvest is inspected personally by a USDA officer under the Cooperative Asian Citrus Psyllid Project and issued a unique PPQ Certificate that indicates it meets all requirements. 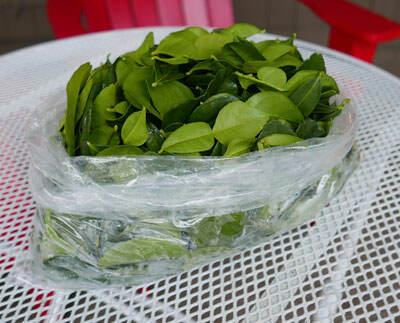 We regularly ship these leaves on a wholesale basis in one pound bags as shown, properly packed and delivered via 2 Day shipping. Order with confidence. We can usually ship 1-5 pounds on the same day of your order. If you require over 5 pounds, it may take 2-3 weeks of preparation time. Feel free to order here and await your order, or call us at 888-618-8424 to discuss your requirements.